Ron Paul Campaign For Liberty worker detained at Missouri Airport for carrying cash. Apparently a few jack boots did not get the word that the original plan to harass Ron Paul supporters had been scrapped. Perhaps the retraction was issued in writing, and no one ever read it out loud. This might have been a problem when dealing with people of the intellectual calibur who; in the first place, found nothing strange about being told that terrorists could be spotted by the stickers that they display. The MIAC document that had already been retracted is discussed below. Judge Andrew Napolitano appeared with John Stossel and Jerry Selente on Freedom Watch TV to give the legal insight on this demonstration police state tactics. Ron Paul Campaign For Liberty worker, Steve Bierfeldt, was detained by TSA in St. Louis for carrying cash. He was traveling home following a Campaign For Liberty event. 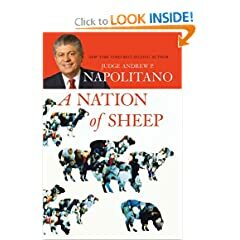 Judge Andrew P. Napolitano also wrote "A Nation of Sheep"
A person who believes in liberty should use extreme caution if passing through Missouri. We might avoid travel to Missouri where possible. It might be wise to relocate any meetings, conventions, or vacations to other areas. Steve Bierfeldt asked repeatedly: "Am I required by law to answer that question?" The police refused to answer his question, while at the same time claiming that Steve Bierfeldt was "playing a game" because he had not waived his right to remain silent. The old trick was to claim that if "you do not have anything to hide you would answer" the unlawful question. Should we assume that the police had something to hide because they did not answer the lawful question? Is there any possibility that none of these police knew that people have a right to remain silent? At the end it was clear, and agreed by all, that Steve Bierfeldt had acted in accordance with the law. Did the police act in accordance with the law? Law enforcement sometimes asks for permission to violate constitutional rights. Law enforcement sometimes claims that they had obtained permission to violate constitutional rights. What would happen if a citizen asked law enforcement for permission to violate the law? Maybe you've heard, or maybe not, but the Missouri State Police think you might be a security threat. Why? Because you support Ron Paul and the Campaign for Liberty. Also, because maybe you own guns, oppose abortion or homeschool. Even, and I'm serious, because you support the U.S. Constitution. I know, it's ridiculous...and probably steams you a bit. But here at Campaign for Liberty we are going to give this foolishness the treatment it deserves. More on that in a moment. Let me give you a bit more background. As you may be aware by now, the Missouri Information Analysis Center (MIAC) recently released a report titled, "The Modern Militia Movement" to over one thousand Missouri law enforcement officers. "MIAC is the mechanism to collect incident reports of suspicious activities to be evaluated and analyzed in an effort to identify potential trends or patterns of terrorist or criminal operations within the state of Missouri. MIAC will also function as a vehicle for two-way communication between federal, state and local law enforcement community within our region." The MIAC warned officers that violent militia members are "usually" supporters of presidential candidates like Ron Paul and are also known for opposition to things like the Federal Reserve and the income tax. The "study" was undoubtably written by some university liberal who knows nothing of the hundreds of thousands of Missourians who share our values. I can only imagine how many hundreds of thousands of Missouri tax dollars funded this. Both Ron Paul and Campaign for Liberty champion principles of freedom, peace, and prosperity. We believe that the Founder's vision for America can be reclaimed through education and peaceful activism. It is a common practice of elitist intellectuals and backroom bureaucrats to attempt to crowd everyone into groups and stick labels on them, especially when it involves those who support a Constitutionally-limited government. Anthony Gregory, editor-in-chief at Campaign for Liberty, has posted an excellent new article on our site concerning government broad-brush fear campaigns. It is important that we respond in the right way when faced with such a government labeling, and the proper way is to go straight to the top in Missouri. The way to fight thugs and ignorant people in authority is not to cower or rage, but to proudly proclaim who you are and what you believe. That's why I urge you to sign our Citizen's Petition here today. Our petition spells out in no uncertain terms who we are and what we believe. And it reminds those in charge of enforcing Missouri's laws that we are citizen activists who will not be intimidated nor embarassed into silence. Simply owning a gun does not make you a threat. It means you are a free citizen. Supporting our Constitution does not make you worthy of a watchlist, it makes you a Patriot. So please, sign our Citizen's Petition today. Be sure to stay tuned for more information on how we plan to respond to the MIAC. Finally, I want to ask you a final favor. If you can, please join us next week as we gather in St. Louis for the first Campaign for Liberty Regional Conference and show the people of Missouri what Campaign for Liberty truly stands for and represents. We will be hosting a free event on Friday Night with Ron Paul and Judge Andrew Napolitano that is open to the public, and the conference will be highlighted by grassroots training on Saturday, March 28. Learning how to properly mobilize in order to implement liberty-based legislation is absolutely critical to our success as a movement, and our Regional Conference will provide you with the tools you need as we move forward. For more information on our Conference, check out our Regional Conference page. For special travel and hotel information, click here. Liberty is never free, and demands vigilance. I look forward to seeing you in St. Louis for an exciting weekend of celebration and training! P.S. And don't forget to fill out our Citizen's Petition, which we will deliver to the Missouri Governor and Attorney General.